A very good win but much harder than the score suggests. Reeds started with 2 disadvantages, namely 4 players missing due to county training and the game being switched in the morning to Camberley due to a problem at the Weybridge ground. The disadvantages were slightly mitigated by Olly Maitland turning up just as the game started and Camberley sportily starting the game later than planned to allow Reeds a full warm-up, many thanks to Camberley. Also thanks to the referee who agreed to travel at late notice to Camberley. Owing to numbers, Camberley 26 & Reeds 21 it was agreed to play 2 * 40 minute half’s. Several players played the whole game which was very tiring for them. The extra 10 minutes is a big step. Owing to the absent players the Reeds’ back-line had to be re-jigged. Ethan played 15, Andre 10 and Ross moved from the pack to 12. All the changes were a successful in their own right. Reeds’ were also missing Callum, their main line-out thrower and it took time for the pack to adjust, but as the game progressed the better the line-out worked with an ever increasing high disruption of the opponents throw. The line-out is becoming a major Reeds’ weapon. The game started at a fast pace that didn’t relent for the whole game, which was a testament to both teams’ fitness. The tackling was what years ago was called robust with both teams delivering many good clean hits, some less so. At school on Monday many players will be sore and some bruised. Although the game was feisty it never spilled over into outright aggression. The referee did have cause to speak to the captains on one occasion but overall the game was played in the right spirit. 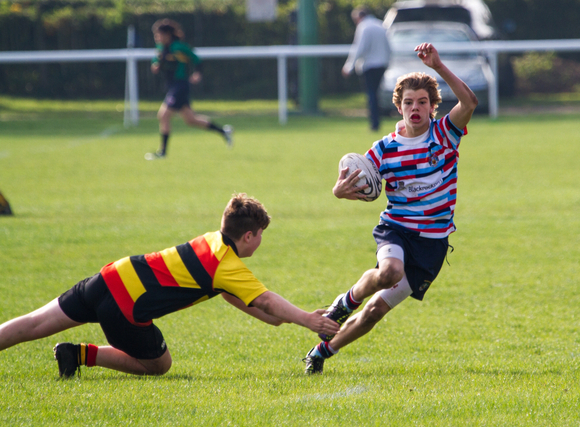 The game started well for Reeds, who were winning good ruck & maul ball and moving it well through the back-line. Ross was taking time to revert to being a back rather than a rampaging forward but throughout the game his defence, especially his tackling was superb. Ross’s tackling was not only stopping their back-line but often driving into backwards. Camberley were becoming un-nerved by the strength of the tackling. On a number of occasions Alfie was set free and made good ground. Finally an overlap developed, due to quick hands and Alfie scored in the corner. Alfie’s pace was becoming a problem for Camberley. Alfie’s 2nd try soon followed, again quick hands and an overlap about 40 yards out utilising Alfie’s pace. Beside the actual try the good point was the support players on the inside, no-one was watching they were getting involved. Unfortunately neither try was converted, difficult kicks from the touch line into the wind. To add insult to injury Matt was injured soon after with a cut around the eye and needed the blood bin. Although he was to return it meant another re-jig, this time for the pack. Ethan took over goal kicking duties. Reeds were getting on top but Camberley had a good driving pack, which was causing problems in the scrum. The referee had a libel reading of the off-side rule, resulting mainly in the Camberley flanker taking up residence in Olly T’s pocket. Just as Olly was surmounting the problem he suffered an injury (kick in the head) which resulted in a spell on the touchline. This meant another re-jig, Andre is 9, Ethan to 10 and Olly M on at 15. Alfie soon followed Olly with an ankle injury but was unfortunate not to return. Jamie, who arrived with a dead leg was asked to play on the wing, which he did until injury forced him off late in the game. Before Camberley could settle, Reeds struck again. Fast ruck ball, quick pass to Ethan and a good long pass to Lucas who sped over. Again a missed conversion from the touchline. 15-0 at half-time but Reeds had had the benefit of the slight slope. The half-time break allowed for Olly T to re-join the fray and the back-line to reset. The pitch which was reasonably firm but had 2 or 3 areas with standing water was becoming clawing and the slope looked bigger than first thought. Both teams changed their tactics in the 2nd half. Camberley often kicked deep in the 1st half but each time the kick was returned with interest. Reeds had basically run the ball confident in their handling and ability to find space on the outside. The roles were reversed in the 2nd half. Camberley played mainly with ball in hand as the half developed. Some initial kicks were returned beautifully with kicks deep into the Camberley half resulting in Camberley being pinned in their own territory for long periods. The kicks were vigorously chased down resulting in Camberley often taking the ball into touch. The return kick policy and the accuracy of the kicking meant Camberley stopped kicking ball and attempted to carry out of defence. At this stage the Reeds’ tackling went into overdrive with Conor, Mat, Morgan, James, Robin, Oscar, Sam & Ross (moved back into the pack) excelled. No-one shirked their tackling responsibility. Camberley’s one remaining weapon was their scrum, which often disrupted the Reeds’ scrum. Olly T and the pack went to a quick strike of the ball, fast flow through channel 2 and quick pass to clear the base of the scrum. Camberley’s weapon was nullified and even their flanker had to stay bound to the scrum. With the kicking game being precise and the change in scrum tactics Reeds were well on top and showing good game management skills. Reeds seldom ran ball back from their half. On a number of occasions the ball went from the scrum back to either Ethan or Andre in the pocket to kick back into the 22 and put pressure on. At this stage the result was not in doubt but points were needed to be scored. The 1st second half try came from 3 rucks won and forward drives followed by a quick pass to Andre running to the blind from behind the pack and scoring in the corner. The try was made to look easier than it was. The conversion from the side-line was successful. Camberley were a beaten team although they game fully fought to the end. The game was now camped permanently in the Camberley half, often the 22. The 2nd try was also a blind side try with at least 6 quick close quarter passes, the final being a lovely overall basketball type pass to Jarrod who fell over the line. Just reward for his hard work and support play. Again the conversion was a success. The pack had total control, had weathered the Camberley storm, were breaking tackles and off-loading with aplomb. The concern now, was Reeds keep Camberley scoreless. The final try was a team effort, which mirrored the game perfectly. The pack turned over ball, carried twice before providing quick ball. The back-line simply passed directly and at speed to put Joe into the corner. Unfortunately the conversion was missed. This was by far Reeds’ best game and displayed the depth of talent needed to compete with top teams. Camberley offered a strong feisty contest but in the end was well beaten. Reeds’ handling, tackling skills were to the fore and the general game management was good. Faced with problems before the game (missing players, meaning re-jigs of position) and during the game (injuries to key players & being 2nd best at the scrum) the players re-adjusted and solved the problems to very good effect. A big special mention to Sam B who stole a few oppo line outs and was aggressive around the rucks, Robin who scrummed well and had some great ball carries recycling everyone of them. Lewis who now dubbed our Pring playing prop and wing in consecutive matches, Jack back to his lethal self in the tackle area, Lucas showing his pace has returned, Jarrod showing great support resulting in a try and Tom with his awesome stepping and defence. The most satisfying fact was that Camberley were kept scoreless meaning a total and thoroughly deserved win. Well, guys it is back to the training ground. As Tim/John would say it is time to consolidate out strengths and work even harder on our weaknesses. Lets celebrate the win but be aware there are harder games to come, starting in 2 weeks with a Cup game against Old Emmanuel. This is not last year’s Old Emmanuel, it is a new and better outfit, so 2 good weeks training are required. Give yourself a pat on the back but then prepare to move on.